Greetings YABCers! Welcome to my cover reveal for REALM BREAKER!! I’m Laurie McKay and I’m thrilled to share my cover with you all. My favorite part is the dragon outline. Sometimes, I try to draw it myself, but my skills just aren’t up there with those of the artist, Eric Deschamps. 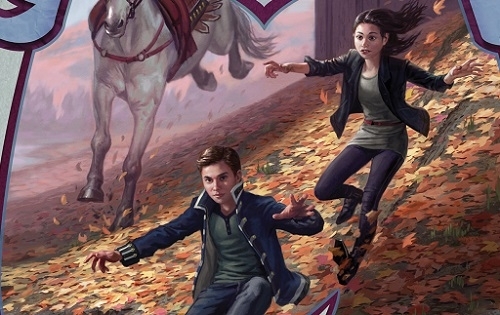 He’s done the covers for all three books in the series and I’ve been impressed with each. 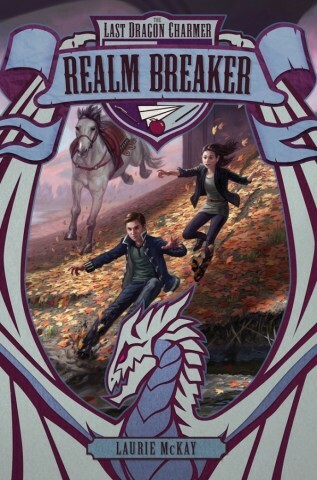 My other favorite thing about the cover is the scene framed by the dragon’s wings - so basically the rest of it. The neat thing is it’s an actual scene from the book. Caden, Brynne, and Sir Horace (he’s the horse) are charging toward the river. If you look closely, you can see the muddy bank near Caden’s boot. The river meanders in the background and there is a bridge column behind them. They were hiding under it just before the charge to the bank. This all happens in fall and there are orange leaves on the ground! I just really love the colors, details, and action and I hope all of you do as well. Dark times are brewing in Asheville, North Carolina. Known to locals as the Land of Sky, Asheville goes by another name in Prince Caden's homeland of Razzon: the Land of Shadow, a place where the most vile villains are sent to live out their days as ordinary middle school teachers. But the villains are no longer content to stay trapped in Asheville. Caden will do anything to protect his homeland. But to keep the villains from completing a mysterious four-part spell and breaking the barrier between realms, he must defeat the wicked lunch witch and the evil math tyrant-all while dealing with a foster mother who doesn't believe in magic and a pesky compliance curse that puts him in mortal peril for three days every month. Protecting the barrier between the realms is no small task. Caden will need the help of his brave friends-and his special gift of speech to charm a ravenous Elderdragon. And if Caden and his allies can save his home, he might finally be able to return to it. 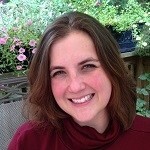 Laurie McKay is an author and biology instructor who lives in Durham, NC. When she’s not working, she spends time with her family and her two elderly dogs. The first two books in her debut MG fantasy series, VILLAIN KEEPER (The Last Dragon Charmer #1) and QUEST MAKER (The Last Dragon Charmer #2) are available now. REALM BREAKER will be available in March 2017. To learn more about her or to see pictures of her dogs (and her family) visit her at lauriemckay.net. Three winners will receive autographed sets of book one and book two. Each winner will receive a signed paperback of VILLAIN KEEPER (The Last Dragon Charmer: 1) and a signed hardcover of QUEST MAKER (The Last Dragon Charmer: 2). I love it! It's action-packed but still gives so many fun background details to let us know the scope of the world. Can't wait to see it in person! Not bad on the cover! Actually, that is perfect! I love North Carolina, I belong in the mountains. An action filled Ya book!? Count me in. I love the cover. Anything with dragons is good! I love the dragon framed cover. It shows action as promised in the synopsis. I like the cover. You can see that action is happening. This series sounds really good! I love the cover and the synopsis. It seems so intricate and full of adventure and with dragons.